What are "Jobs to be Done"? When thinking about how to launch a new product or bring in new customers, too many companies focus on what people are currently buying. They use existing purchase data to define their markets quite narrowly. They begin to think of themselves as booksellers and PC companies. Then when sales dip or management makes aggressive growth demands they end up asking the wrong questions. How can we sell more books? How can we build a better PC? This tunnel-vision approach to market definition creates a very small solution space, and it can blind companies to threats from non-traditional sources. Jobs to be Done (sometimes referred to as JTBD, or Jobs-to-be-Done) are the underlying tasks that consumers are trying to get done in their lives. They are foundational for understanding what motivates your customers and why customers behave the way they do. And because Jobs to be Done gives a broad yet rigorous view of where both opportunity and tough competition really lie, they are also key for crafting irresistible innovations that don’t just mimic every other competitor. For example, your typical car buyer is not simply looking to purchase a mid-size sedan, but also to express his personality, impress his co-workers, and meet the needs of his growing family. Those jobs may also be satisfied via totally different avenues—an expensive vacation to impress his co-workers, for example, or a sporty convertible that he feels might better express who he is. In this way, the company that makes the mid-size sedan has a notably broad range of competitors. This means that the company also has many available levers to pull beyond simply bolstering everyday specifications like leather seating and luxury audio systems. Jobs are typically broken down into functional and emotional categories. Functional jobs for the sedan might include qualifications like getting good gas mileage, having good safety ratings, and performing well in the snow. Emotional jobs, often over-looked by companies but vital to product success, could include the driver’s desire for self-expression. Emotional jobs are often more challenging to identify and trickier to address than their functional counterparts, but a product that satisfies on both functional and emotional dimensions has the potential to command a premium in the marketplace. Jobs to be Done helps teams ask the right questions and to reimagine problems as opportunities to serve unmet needs. It pushes them to think beyond the boundaries of products and services already offered by emphasizing underlying customer motivations rather than products themselves. And the implications from Jobs research can be profound, impacting not just product development but also sales strategy, branding and messaging, innovation portfolio management, and more. How do you turn a list of Jobs to be Done into actionable business and innovation strategy? After Harvard Business School Professor Clayton Christensen popularized the Jobs to be Done theory in the early 2000s, the New Markets Advisors leadership set out to develop a structured and rigorous method for making the most of this customer research. Distilling learnings from decades of Jobs to be Done projects, we discovered that there are 8 contextual elements that are key for extracting “so what” business insights from Jobs to be Done research. 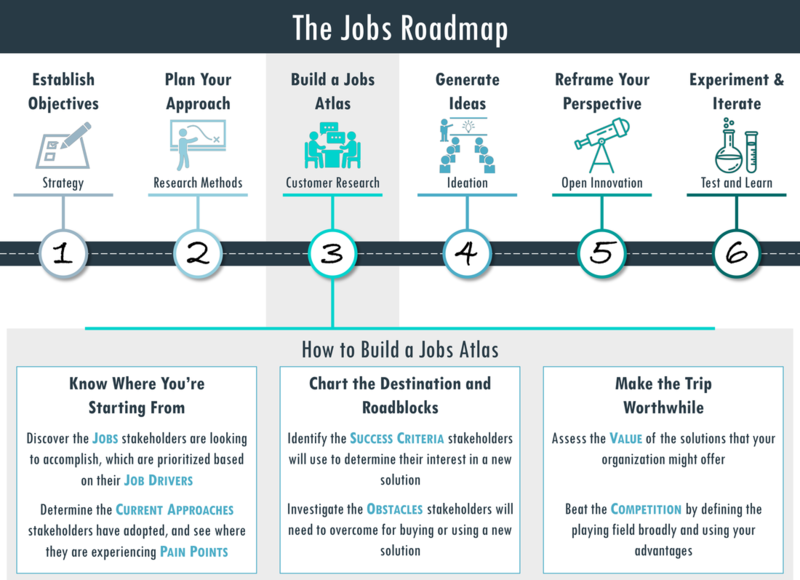 Our proprietary Jobs Atlas, pictured below, is the subject of our award-winning book Jobs to be Done: A Roadmap for Customer-Centered Innovation. Ask about specific occasions, not average behavior. The richness of Jobs research comes not from generalities (“I have a soda with lunch”) but from situational details (“I had a soda because my morning started early and I needed a midday pick-me-up”). Asking about general times tends to lead to rational answers, rather than what actually happened. So instead of asking about what might lead a customer to change doctors, probe on the specific last time that the customer changed doctors. What were the triggers? What options were considered? If they couldn’t find a suitable replacement, what else would they have done to improve the situation? Take our interactive quiz: How well do you understand Jobs to be Done?